With the launch of Sputnik 1, there was a need to accurately track satellites and predict their trajectories. The satellite and its carrier rocket were detected by the RRE Radar Astronomy group using a high power radar fitted to the radio telescope based at Morgan’s visitor centre formally the RRE Staff club. The Royal Radar Establishment (RRE) had experience of optical tracking as it was using cameras to track aircraft fitted with flashing lights and use these to calibrate guided weapon tracking radars. In order to obtain accurate positions the cameras were separated by a baseline of around 50 miles with a station at Sheriffs Lench in Worcestershire and one at Lye Vallets, Herefordshire. There arose another requirement to record photographically the luminous entry trails produced by the UK Blue Streak Ballistic missile. Both the existing cameras had limitations in detecting low light fast moving objects. A new design of camera giving greater measurement accuracy and capable of tracking low light objects was therefore needed. It was designed by Joe Hewitt at RRE as a field flattened super Schmidt type camera. The optical systems were built by Grubb Parsons and the shutter system, control gear and mounting were built in the Engineering Unit and Labs at RRE Malvern. The Hewitt cameras in operation were superb both optically and mechanically, it was and remained the most accurate satellite camera in the world, capable of measuring to 1 second of arc. Its main role was tracking satellites for geodetic analysis in order to improve worldwide mapping. At the end of the project, map alignment gross errors had been reduced from a couple of kilometers to a couple of metres. The principles involved are similar to today’s satellite navigation system although in the projects case it was multiple ground positions looking at one satellite. Current Sat Nav uses multiple satellites to calculate your position on the earths surface and the work carried out by the Hewitt cameras allows that position to be accurately matched to a map. 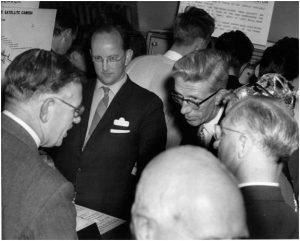 In 1967 the two cameras were purchased by the Ordinance Survey on the imitative of the Director General, Major General R C A Edge. 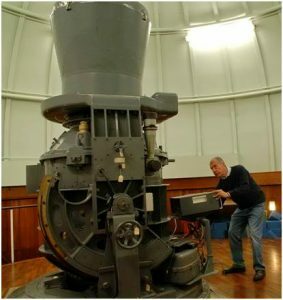 The Lye Vallets camera was moved in 1964 to the Royal Observatory Edinburgh (ROE) where it operated until 1975. This together with the Malvern camera greatly improved the measurement accuracy of satellite orbits. In 1978 it was moved to Siding Spring Mountain in New South Wales in Australia were it operated from 1982 to 1990. The Malvern camera at Sheriff’s Lench worked until 1982 and was then transferred to Royal Greenwich Observatory Herstmonceux RGO). When the RGO site closed in 1990 it was placed in the museum where it can be seen today.